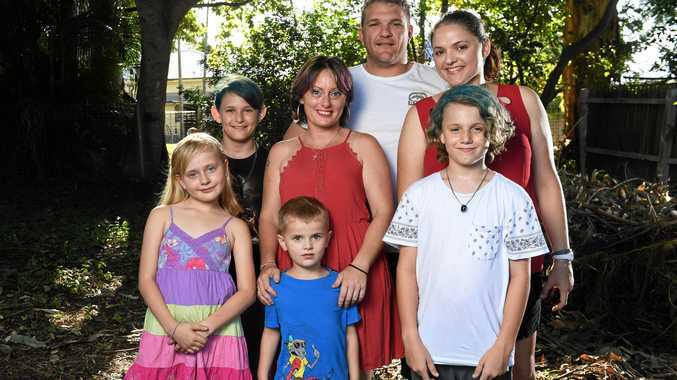 AFTER a 14-month battle against ice addiction, Renee Finall has finally got her kids back. "I was born addicted to methadone. I've been battling addiction my whole life," Ms Finall said. Last year at only eight weeks into her recovery, Ms Finall spoke to the QT about her battle. Back then she said one of the hardest things was the disappointment in herself for repeating history. "It's sad because my daughter left my home the same age I left my mum, for the same bloody reasons. "Having them at home every day, I would constantly tell myself I would never do what she did to me." Ms Finall said her mother used drugs while she was pregnant and her brother and sister still use drugs. "It was the lifestyle we were raised in." When she was taken into foster care, she brought drugs into her life starting with alcohol and marijuana at age 13. "I'm now 32, it's been more than half of my life." Now Ms Finall says the reason she was able to change her life for the better was because her kids were taken from her. She had a choice to hand them to family or DOCS - she chose family. "The kids left six months before my recovery started," she said. Now she's been clean and sober for just over 14 months. Ms Finall said two months ago she was given the news she would be reunited with two of her children - a son aged four and a daughter aged 9. She has a third who lives with their father. She did every course possible on parenting and worked hard to make sure it would happen. "I knew I was getting them back." Then on Valentine's Day she moved into her own home where she now lives with the kids. Ms Finall said she had also suffered from mental illness and was in a dark place before losing her kids. "I was still living the addict lifestyle. I knew the state I was in was no good for them." "It was the best thing that could have happened. "I had no excuses to get the help I needed." On her road to recovery she found a social network and Christ, through Springfield Christian Family and Westside Community Care. "I was searching for anything different to what I knew. "I used to get free bread through the centre." Then she found out the centre was run by a church. "I never knew that. God was already trying to lead me." She sent Pastor Phil Cutcliffe an email telling him she was broken, a drug addict and asking questions about God. "I was just lost. He invited me to church." Through the church's support she started her recovery and met the "love of her life" who she has been with for one year. "Through God I found everything, I am truly happy and fulfilled. Narcotics Anonymous, 'NA' is very spiritually based. I would never have been accepting before. Now I'm living in a rental property, I'm paying my own bills. "God is leading me to inspiration." Mr Finall believes she has gone through it all for a purpose. Now she wants to help addicts who are suffering like she used to. She's working towards studying a diploma that will allow her to help those with drugs, alcohol and mental health problems. And she's proud to say she's done it on her own with the support of the church and NA but said recovery wasn't easy. "Like any other user or addict, I'm still only one thought away from picking the drugs up. "I was more sick then when I was using. I had to change everything. "I refuse to have addict behaviour." She said drugs were an epidemic. "People are suffering in silence because no one wants to talk about it." She said addicts died every day because it was easier to stay on the drugs. "You even need a licence to busk. There's hoops covered in fire that you have to jump through." But ice was so easy to get: "You can get it easier than groceries". "It's been 14 months but I still fight on a daily basis. "It's such an ugly disease, a lot of people aren't strong enough." Ms Finall will be speaking about her journey at the Westside Community Care Seeds fundraising dinner on June 10 at the Brookwater Golf and Country Club, see www.wccare.org.au/ for more information.